Bright Blessings at the Equinox! We’re moving into a new phase of our journey, a new passage. That’s what each new season really is. And I think it’s important to always move with intention and attention – to be fully present so we can reap the benefits of what has passed and be open to receive what new gifts are available to us. I love the gateway equinoxes offer – the balance time poised between what is ending and what is beginning. I always spend time at this point reflecting on what has passed and preparing to close the old season out, before opening the door to the new one. Without doubt this has been the most curious and atypical summers I’ve ever experienced. It’s certainly been the longest hiatus I’ve spent from blogging. What have you been doing for these past three months? What are the projects you’ve been working on? Are there things you’re stalled on? Are you feeling like you want to try working on them anew, or is it time to put them aside? What has been your greatest joy? Do you feel like there were some important lessons, some important a-ha moments during this time? What seeds did you plant, and how are they doing? You’ll also likely have some regrets and farewells. Just note them, remembering that it’s all okay, and that it’s all perfect. Were there any surprises in your Summer? If you had to come up with one, two, or three words to describe this period, what would they be? And now you have a sense of the journey of these last few months that has brought you to the point you’re at now. Just take a deep breath and take it all in. After digging around in the experience of this past season, organizing our thoughts and feelings about it, it’s time to close to door behind us. We want to appreciate it and say goodbye. We don’t get to carry that time forward with us, but we do get to integrate and carry the gifts and blessings, the understandings and perhaps even some of the questions with us as we move forward. Give yourself a moment to really allow the old season to be complete, and then allow yourself to arrive in the present moment. Know that it is essential for the full expression of all that has occurred that you let go of your awareness of it, and bring yourself into the present moment. It is important to pull your energy from the past into the now moment. To allow the full fruition of those thoughts, actions, experiences to take shape. Becoming present; becoming current; embracing now. Allow yourself, all parts of yourself, to enter the field of peace, of love, of light. Feel yourself come back into that neutral energy, that zero point, that clear field. Take a slow deep breath and feel how good that is. Your energy, your vitality, your very presence now focused here. It is a time to feel enlivened and refreshed, with your attention in your heart, in the energy of appreciation, in the energy of possibility and joy. And so here we all are on the threshold of this new season. A fresh road, a clean slate, new possibilities. So what is it you want to create, to express, to experience this new season? Let yourself know what is calling you. Open the way. For most of those reading this blog, autumn is the landscape we’ll be working in for the next three months. It’s our new container. What we really want to do is partner with t he energy available to us to create a vibrant, joyful, grace-filled autumn. We want to leverage the gifts of the natural rhythm of the season. It’s my belief that wisdom and hope bridge through each season’s doorway, and we’re called to find ways to anchor and flow those possibilities into our own lives, and bring them into personal expression. We want to work in harmony with what’s available to us – to flow with the stream of autumn, not against it. Whether you’re willing to admit it or not, we’re all good interpreters. We all know how to read energy; we all know how to recognize signs and natural rhythms and changes in tempo. And as the seasons change, we’re called to make adjustments in how we respond as well. It’s something we do naturally, and yet when we work with this in a more conscious, more aware way, we invite more ease and flow into our lives. Autumn can be a time of contraction – pulling in from summer’s warmth and expansion. Summer might have been all about loosening your schedule, while autumn is often a return to more structure. 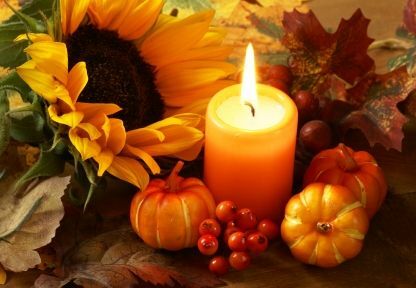 Autumn can be about harvesting, giving thanks, feasting, creating balance, letting go/releasing, honoring ancestors, preserving. Gourds, pomegranates, acorns, apples, marigolds, revisiting the tale of Persephone. These are all places to start. All places to step into the seasonal stream. And so I ask you, how can you use the energy of these things to activate your dreams, your plans, your actions for the season? How can you use them, and your own autumnal metaphors, to inspire you? One of the things I love about autumn is the abundance of apples, and my local CSA farms are starting to share their harvests. 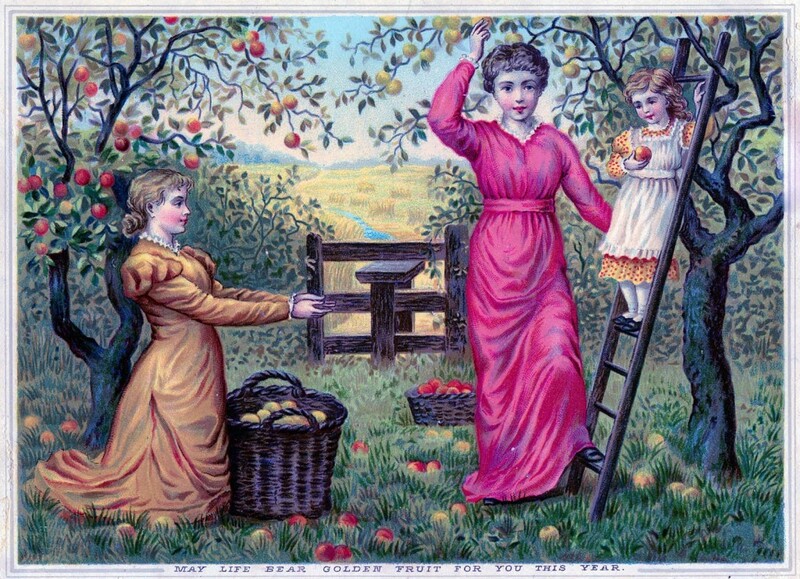 I love this vintage postcard, especially with its caption: “May life bear golden fruit for you this year.” I’m happy to make that my wish for all of us. I know that moment, and love it as the blessing it is. And I receive it will a heart-felt yes. The seasonal wheel has indeed turned, and may we enter this cycle ready to greet all its golden gifts with gratitude and meet all the opportunities from the place of yes deep within us. What’s calling to you? Do tell – you know I love to hear. How perfect to describe these moments as punctuation heralding the seasons! Wishing you a most wonderful Spring Susan. It always does my heart good to think about your garden, knowing we’re each holding the blossoming and the darkness cycles opposite one another, and therefore available at all times. Oh goodness Yamini – I’m sorry to hear about your injury. Having basically taken the summer off in media retreat, I haven’t kept up very well with what’s been happening. May your recovery be swift! And here’s to an Autumn filled with an abundance of wonderfulness. Letting go of summer has been difficult for me because there were so many surprises, some of them extremely unpleasant. I’m still resolving them in my mind, coming to terms with big changes. As Dickens wrote though, “It was the best of times, it was the worst of times.” I had one of the best birthdays of my life in New York with both daughters and their significant others. But I had to deal with some disliked medical news and the abandonment by the man I loved. I do enjoy the fall and the crisp air, the holidays, and reading inside with a coffee to the sound of the rain or wind. It’s a new start. I don’t think many people would argue with you Margaret (or with Dickens) that “it was the best of times, it was the worst of times.” Indeed! But I’m glad you’ve had some deliciously good things to balance the hard. And may autumn deliver many more golden moments to fill your heart. For the past few years, I’ve been thinking of autumn as beginning at the start of August – when the cereal crops are being harvested, and I start feeling the shortening of the days and (more prosaically) start using my daylight lamp in the mornings. The apples are still on the trees, but the fields are already bare, and there’s only a week left in which one can pick blackberries before the Devil spits on them, according to folklore. Still, there is definitely a sense of transition this week, that we have turned definitively towards winter. And, after a spring of travelling and a rather unsettled summer during which I didn’t quite know what to do with myself, I am at last beginning to regain a sense of my identity and form an idea of where I’m going next. I celebrate your grasp of natural time Kathleen – each season really is both wildly and subtly different depending on our location and our inner compasses. The idea of the Devil spitting on the blackberries is something I’ve not heard, but I tell you it absolutely delights me. You can bet I’ll be finding a way to include it my conversation. I’m with you in feeling like I was unsettled this summer, but am back to being pulled into myself again. And now it’s time to move forward. Hooray for that! Oh Friend, a fabulous post for a most wonderful season! DELICIOUS AUTUMN! It is magical in its own right! And the glorious colors always inspire! Thank you, thank you, thank you for the fantastic AUTUMNAL EQUINOX greeting in my mailbox. You ALWAYS, ALWAYS hit at just the right time. I AM GRATEFUL! It’s always a delight to visit your mailbox Vicki, and join in your celebration of the new season. Wishing you one filled with color and endless inspiration! I’m truly sorry to hear this is a struggle for you Hilary. I’m holding you in my thoughts. reversing gear here , spring has sprung… and while you enjoy all the juicy warm fecund autumnal tones here it is pinks and whites and crisp blue skies with increasing sunshine and tiny shoots poking their heads up and saying what what what is going on , on planet earth. well just about everything and anything only limited by our imagination. great checklist deborah to reflect upon and I really like that whatever the season it is a time of movement and to move with intent and pay attention.indeed! It’s always a joy to read your words Sandra and hear your reflections. May your Spring bring abundant blessings! Great thoughts here. Thank you for writing this post. I like autumn’s energy. I think it’s the letting go part of it that is calling to me right now. I’m envisioning this season as being a time for me to refine what and who I’m going to allow in my life. My priorities have shifted over the summer, and I’m left with a feeling that whatever comes next I shall consider to be golden fruit. That phrase will be my mantra! I love that so much Ally. May autumn bring you an abundance of golden fruit. I’ve really appreciated how you’ve taken the time to refresh and re-energize and refocus – yay you! Ah Deborah…fortunately, I subscribed to your newsletter as well and what a beautiful one it was again. It triggered a lot inside of me. This post, again much needed and I am definitely going to take your advice and answer the questions. Maybe I will find my sparkle again. Thank you for your kind words about my newsletter Patty – it’s always my hope it serves by bringing love, light and peace to all who choose to read it. I love that you considered reflecting on the questions I proposed in this post. I hope autumn is continuing to unfold for you in ways that return your sparkle and strengthen your delight!